Are you looking for a salad dressing that will wake up your senses? That will turn the simplest dishes into gourmet fare? That will cause your dinner guests to never forget their meal? Here it is! 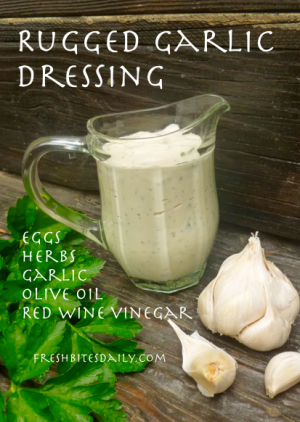 Your own…rugged garlic dressing! This dressing has been a family favorite for almost 25 years. It comes from Julie Jordan’s Cabbage Town Cookbook. The Cabbage Town Restaurant is gone and the book is out of print but get a taste of this dressing and you will go in search of a used copy of the book. It is worth the hunt! There’s lots of fab recipes between the covers of this classic. This dressing is yours for the making. Basically, rugged garlic dressing is a homemade mayonnaise with a major kick to it — an intense kick, a super-healthy kick, an unforgettable kick. If you are still reading, I assume you love garlic. How could you not? When you run out of garlic, you close down the kitchen. Right? Well, you at least put it at the top of the grocery list, even make a special trip to the grocery for more. Using the following recipe, you could produce two very different flavors with this dressing. In one instance use fresh garlic; in the second use roasted garlic. The fresh garlic produces a sharp heat. The roasted garlic is intensely earthy and garlicky, but not hot. Enjoy them both! Besides using this dressing on salads, like our red cabbage slaw, use it as a dip for veggie sticks, a spread on sandwiches, topping for steamed or roasted vegetables. Use it as regular mayonnaise whenever you are feeling bold. When you make this dressing, make enough to last a week. The flavor stays fresh and bright for that long. Of course, you will want to keep it refrigerated in a tightly covered glass container. Use a food processor for the amounts given here. They could overwhelm a blender. Place the eggs, salt, garlic and 2 tablespoons of vinegar into the processor. Whisk until creamy. Begin adding the oil in a slow trickle. Watch for the change of texture to take place. The mayonnaise will “take” and become thick. Continue whisking as you add the oil and vinegar alternately – in thin streams. Fold in the finely chopped herbs. If for some reason the mayonnaise doesn’t “take”, just use it as a salad dressing. None of its superb flavor is lost. 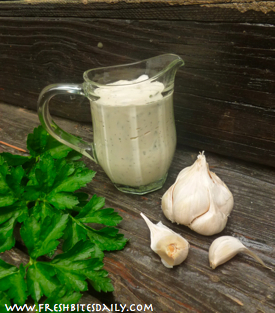 6 Comments on "Rugged Garlic Dressing to Wake Up Your Senses!" written via him as no one else recognise such unique about my trouble. customers the option of viewing specialized mobile channels. a few minutes everything should be back up to date. device, since thin clients normally do not have any memory storage of their own. you move on to create a smoky, summery, barbecued tofu using just my little urban oven. Herpes Chapped treatment chickenpox in adults Lips 2011. That beat analysts’ forecasts by 4 cents per share. starts to appear. At the same time.